American horror movies have hit the bottom of the barrel. I’m not even sure I’m using that phrase correctly. Let me just say that today’s horror films are terrible. They’re predictable, lazy, lack scares, and there’s just an overall lack of innovation. Simply using jump-scares to rile up an audience is NOT how you make a proper horror movie. A good horror movie has building tension and has questions that aren’t answered in a nice neat way (think The Shining) . I don’t want to know why the VHS tape is killing people in The Ring, it dulls the feelings evoked on the audience. It Follows is a shock to the pulse of all American horror films, which have shown almost no signs of life in quite some time. 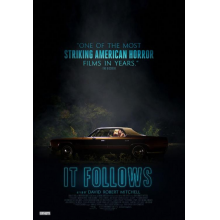 It Follows follows young college student Jay (Maika Monroe), who after sleeping with new fling Hugh, has a strange force after her. It’s some sort of curse, and only those who have been affected can see this strange entity walking towards them taking many different human forms. Jay along with her friends Yara (Olivia Luccardi), Kelly (Lili Sepe), and Paul (Keir Gilchrist) attempt to figure out just what is going on. From beginning to end, It Follows is an eerie ride. The tension builds from when we first meet Jay, up until the last frame. No matter where Jay attempts to hide, there is that thing walking slowly towards her. If it reaches her, she’s dead. You as the audience is right there with her as we become engulfed with the mounting fear of inevitable death. Not only is this accomplished with a compelling story, the music adds to the overall tension in the movie. It’s an erie set of tracks that has a lasting impact on how you view the movie. My absolute favorite part of It Follows is that “It” is never fully explained, or explained at all. There is so much room for interpretation, yet the filmmaker was able to tell a tight concise story. The worst part of almost every other horror film is the third act. They tend to go like this. You’re introduced to something in act one, it plays out in act two, but by act three everything needs to be figured out. It drives me crazy. It Follows doesn’t subscribe to this either. It could certainly be some sort of STD, as sexuality is at the core of the film. It’s about college kids just coming into their bodies as they become more and more sexually active, and all the fear that accompanies this transition. Regardless, It Follows is an unsettling film. Director David Robert Mitchell certainly has an affinity for 80’s horror films, and his influences are cleverly laid throughout his picture. From shot compositions to set pieces, It Follows has an almost timeless feel to it. Mitchell and cinematographer Mike Gioulakis used a wide-angled sense throughout, giving a grand scope to a picture that was made for just $2 million. It’s hard to figure out what year this movie takes place in and that’s also what makes it great. From the old TV sets and cloths to the use of light, it has an 80’s feel but takes place in present day. There is so much tension and other things going on that your average person may overlook these elements, but they’re there. It add to the overall feelings I took away from the film. It honored horror’s history but created its own niche. The makings of a classic. My only real negative about the film is the quality of acting, although Maika Monroe was better than her supporting cast. It’s not great. It’s more than serviceable and doesn’t take much away from the film, but it is noticeable. I overlooked it for the most part as the tension Jay felt was also felt by me. I didn’t know what was going to happen, a feeling I rarely have in modern horror movies. This is what American horror films have needed, and if It Follows is financially successful, expect the major studios to “borrow” many of the elements that made IT stand out amongst the sea of mediocrity.